Wurstfest: A Mount Angel Celebration of German Sausage returns to Mount Angel for a fourth year. 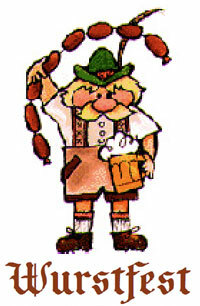 Mount Angel area sausage makers present their best wursts at the fest, authentic German beers are on tap, and regional wines and Bavarian glühwein is available. Entertainment includes Oktoberfest-style music and dancing. This year’s fest takes place at the brand new Mt. Angel Community Festhalle on Friday, February 17 and Saturday, February 18. Hours both days are 11am until 11pm. Included in the $10.00 adult admission fee is a souvenir glass Bavarian beer mug or wine glass (for first 2000 attendees). Anyone under 21 gets in free with an adult.